Ah, Helga. The bully/ unrequited lover in Hey Arnold. Re-watching the show, she is the best character and her episodes are the best of them all. And even though she is a very well-known character from the show, I think she is underrated because of her deep character development. For starters, Helga is probably the smartest student in her class. She is a prolific writer, she gives Shakespearean style monologues, and is very witty and sarcastic, which is a characteristic of intelligence. We are taught in the show to see Phoebe as the brightest, but I’m sure it’s really Helga. Also, she had a difficult childhood, which they highlight by having her go to therapy. First, the fact a kid’s show was brave enough to include therapy and make it seem like a normal and comfortable place is INCREDIBLE. Second, looking at Helga’s past helps define her so much. We literally don’t know Arnold’s last name, but we got to see Helga’s past and her development. And discussing difficult issues like absent parents and mental health in relationship to bullying, I would be surprised to see that in a children’s show today. Instead of Hey Arnold, it should have been Hey Helga, because she ended up being the better developed character in the end. What is your favorite show from your childhood? Share in the comments. Oh man. I don’t think I’ve really caught a lot of episodes of Hey Arnold to be honest. I was stuck on the Captain Planet and Magic School Bus on PBS. Lol. I’m thinking I might need to catch up on my childhood and watch these all for the first time. It’s that 90’s Nickelodeon time frame. I only caught it because I have an older brother. Ah.. I didn’t have cable then couldn’t see it. I loved Clarissa Explains It All! That was a great show. Oh that show brings back memories! I love Helga too! What you take away is she was the most interesting because there were layers to her, she seemed totally mean but she wasnt totally anything just like us. Exactly! She has depth, unlike some of the other characters in the show. Helga is such a crazy, fun, wickedly brilliant character. I love the 90’s/early 2000’s kid’s television where the girls were smart and tough. I’m feeling the nostalgia here. Helga was my favorite character on Hey Arnold so it’s great to see her getting some love at last. She was definitely an underrated character. Love this! 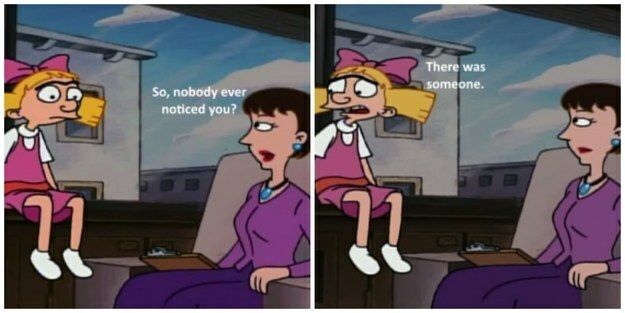 Helga always cracked me up. Her secret shrine to Arnold was the best, haha. Yes! This is perfect and so so true. And you’re completely right. Helga episodes were the best! I absolutely loved this show, and always loved Helga as a character. Great post! My favorite show was the Rugrats !!! Man ! !back then the shows were good !! !